MANILA, Philippines – The Civil Service Commission(CSC) released on Wednesday, May 16, the results of March 18, 2018 Civil Service Exam- Paper and Pencil Test (CSE-PPT) also known as Career service examination. 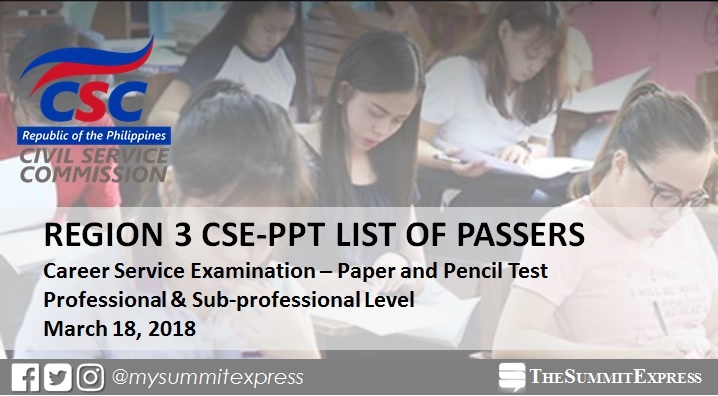 The complete list of passers for Professional and Sub-professional level for Region 3 (Central Luzon) is available on this page as announced online. Note that passing the exam would result in the conferment of either Sub-professional or Professional eligibility. Sub-professional eligibility is appropriate only to first level (clerical) positions while the latter is appropriate up to second level (technical) positions. Said eligibilities do not apply to positions that involve practice of profession or that are covered by special laws. The CSC emphasized that eligibility is a minimum requirement – along with education, experience, and training – for permanent appointment to government career service positions. Passers shall be issued a Certification of Eligibility (CoE) printed on CSC letterhead, free of charge. Passers must personally claim their CoE. Representatives are not allowed to claim the same. Claiming of CoE shall be available approximately 30 days after the posting of the List of Passers or as indicated in the corresponding advisory of CSC. Those who will pass should coordinate and verify first if their Certification is already available before going to the CSC Regional/Field Office. Contact numbers of the CSC office may be accessed at the CSC website.